April 8, 2011, Washington, DC — On Thursday, April 7th, 2011, Iraqi forces, on orders from Iraqi president Nouri al-Maliki, massed columns of military vehicles, including combat forces and engineering equipment, in and around Camp Ashraf, the residence of approximately 3,400 Iranian refugees associated with the Mojahedin-e Khalq organization. At least 65 military vehicles carrying new military forces had entered Ashraf by late Thursday afternoon. Shortly thereafter, Iraqi forces launched a savage attack against the unarmed civilians living in Camp Ashraf. 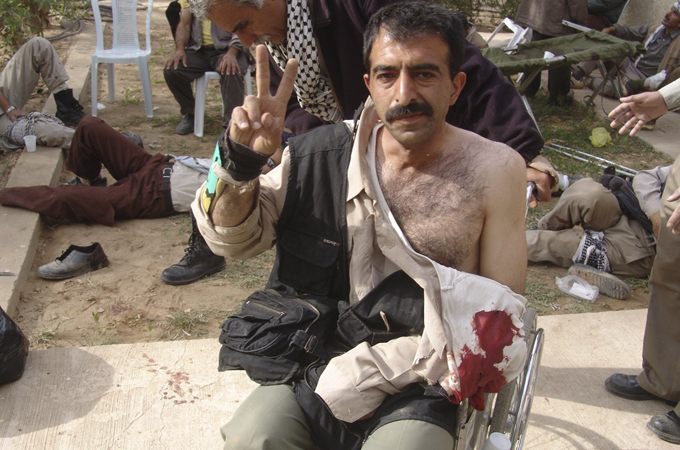 By April 8, 2011, a reported 30 Iranian refugees had been killed by Iraqi forces, and approximately 200 more were reported to have been wounded. A medical source at nearby Baquba hospital reported that most of the Iranian victims had been killed or wounded by bullets. Notably, although the residents of Camp Ashraf are considered refugees and thus should benefit from special protections under international law, as of this point in time, the UN Refugee Agency (UNHCR) has not issued any statements of condemnation of the Iraqi government’s massacre of these Iranian refugees in Iraq, and has not issued any public requests for international assistance to protect the refugees. Mission Free Iran strongly condemns this brutal atrocity by the Iraqi government against the civilian residents of Camp Ashraf, who are protected under all humanitarian laws and conventions. We further decry the silence of the UN Refugee Agency in the face of this massacre of Iranian refugees in Iraq. Iraqi authorities should be held responsible under the law for this atrocity.